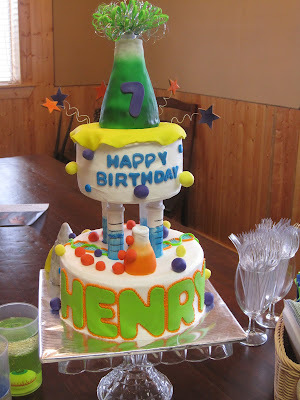 The atomic birthday cake, complete with a rocket, atoms, beakers, and test tubes. Made here in Brenham at the Brenham Olde Towne Bakery. 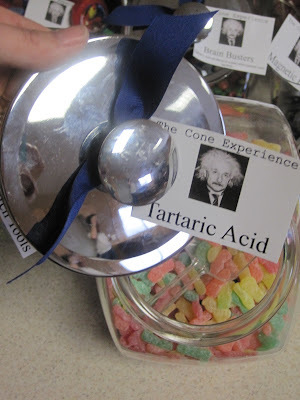 They also made decorated sugar cookies to look like beakers, test tubes and Albert Einstein. 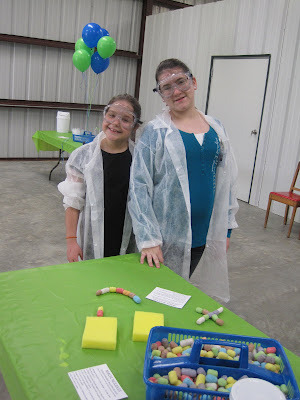 Keep in mind the party was in a barn, a science party with experiences can be MESSY! 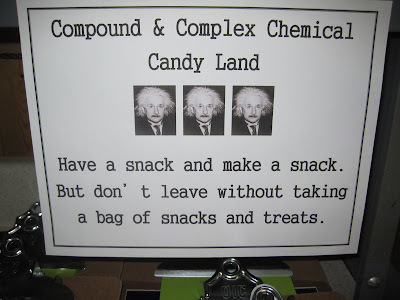 The Compound and Complex Candy Land Bar, complete with tartic acid (sour patch kids), Brain Busters (M&M's), Atomic Pops (lollipops), Research tools (crayons), and on and on. 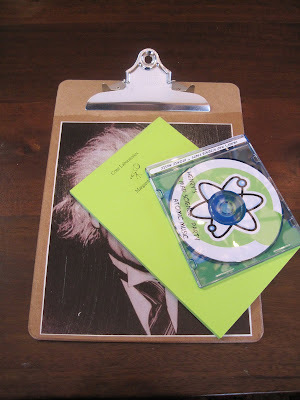 The party favors, an Albert Einstein Clipboard that I decopage,I also made a music CD with a atom label that read "Little Eintstein's Mad Science Party Atomic Music", and each guest also recieved a personalized notepote with a telescope on it (Little Einstein wanted one for his birthday). I'll blog later on how to do the clipboards. Pookie (big sister) and cousin trying out one of the experiments. Party guest Colton trying out one of the experiements - Insta Worms. 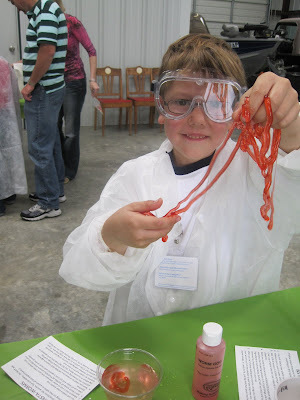 This experiement was a BIG hit, the "worms" were so much fun to make and really neat. All the experiements can be found on the Steve Spangler website. 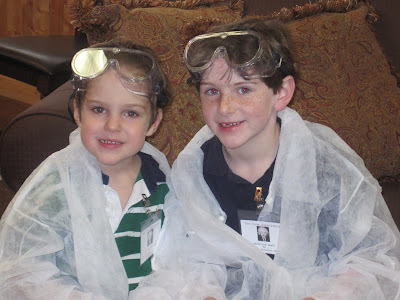 Each party guest was suited up when they arrived - lab coat, safety goggles and name tag (Professor Colton, of The Smith Research Group). 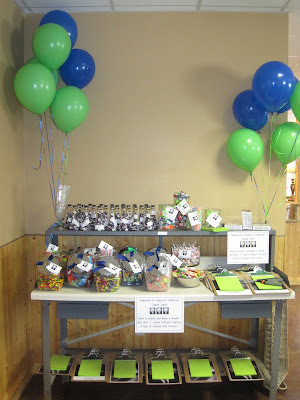 This table was decorated with old bottles filled with oil and water (I colored the water with food coloring). 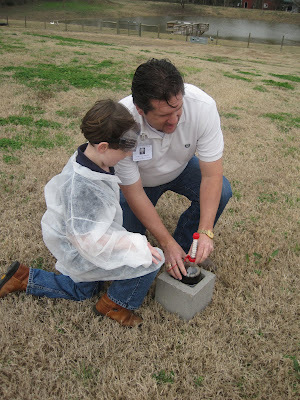 The Judge and Little Einstein getting ready to create a gresyer. 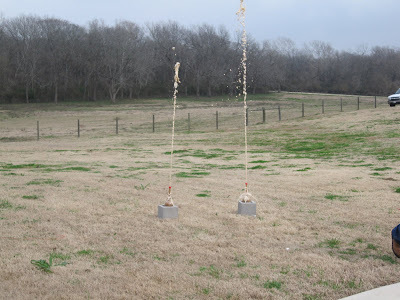 You need a two liter bottle of Diet Coke and 7 mentos candy, drop mentos candy in and watch out! This was really fun, we did it six times!!! 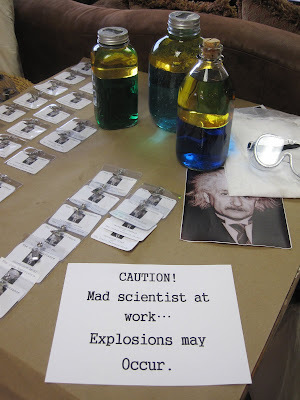 We also let each party guest make snow, do a pop rock experiement, and make a film canister fly in the air (add alka-selzer) over and over again. 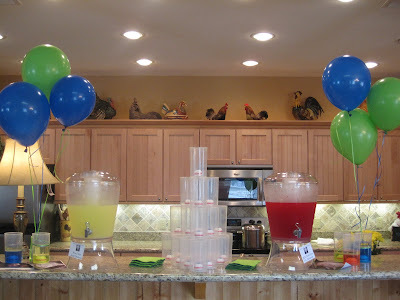 The drinks were served in plastic beakers with eyeballs in the bottom, I served lemonade but made a tag attached to the lemonade that read "H2O,Dextrose, and citrus acid" the red kool aid tag read "H2O,Dextrose,and Red Dye #5". For lunch we served hot dogs and chips (Little Einstein's favorite and it was his request). 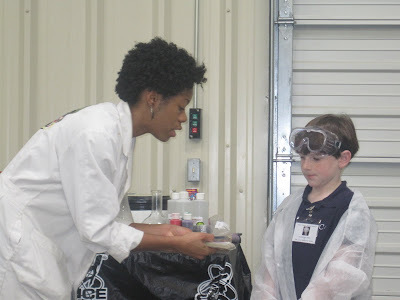 We hired the Mad Science group to come and do some more interactive science experiements. Little Einstein is pictured here helping Conductor Chloe. She was full of energy, entertaining to watch, and fun. The kids loved her and the things she had to show the children were neat and educational all at the same time. It's hard to believe Little Einstein is another year older. He such a neat kid, I'm never surprised at what he's going to say or ask about next. Colton was so excited to show his sister and brothers the awesome birthday party he went to! What a fantastic party. That Henry is a very lucky boy. Thanks for sharing all your great ideas. You are sooo creative! I love to just cruise your blog, it just makes me want to see more more more. Keep it up and posted!